The anagram SEO (Search Engine Optimization) gets bandied around a lot in different white papers, but for a good reason. A little over 80% of those that boost their SEO practices saw returns almost immediately with 42% reporting a significant improvement. Contrary to what many people think, SEO isn’t rocket science. It just takes some effort and time. SEO can be broadly categoriesed into On-Site SEO and Off-Site SEO. 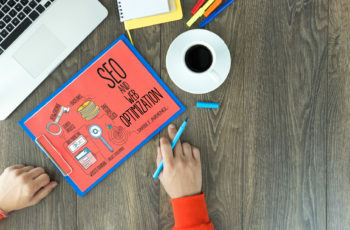 In this article, we’ll discuss about the best practices of On-Site SEO, but first, let’s go over the difference between On-Site SEO vs Off-Site SEO. In a nutshell, On-Site SEO is about optimizing your website to have a better ranking on search engines. These factors include your content, the way your website is coded, loading speed of your website, and many others. Off-Site SEO on the other hand are about factors outsides of your website. For example building backlinks from other websites are examples of Off-Site SEO strategies. Arguably the most important element of on-site SEO is your H1 or your header. Optimized titles get clicks and clicks improve rankings. You’re guaranteed to get the results you want with a great title. Here’s how to make sure yours stands out from the rest. Make sure your chosen keyword appears once – but only once! – in the title. Some think that jamming in a keyword as many times as possible is the path to success but you’ll actually take a hit. Another rule that’s pretty steadfast is to keep your title close to 65 characters. You might feel the need to scrub your older pages when you feel they become irrelevant but that’s a mistake. When you yank your old pages, you pull your old keywords. Find a way to optimize user experience on your old pages. If it links to a product that’s out of stock, redirect them to a similar item. If it’s old information, include a link to the update. When crafting your URLs, keep them pretty. What that means is making sure the keyword shows up in the URL. Make sure you keep it free of any special characters, like brackets, as well. For best practices, make a simple and clean URL with just dashes between the words. Meta tags are necessary for on-site SEO and you shouldn’t neglect them. Although they’re not as big a deal with Google these days, they still need to be unique and user-friendly. It’s a small thing but everything counts – clean up your meta tags. Bounce rates are a big part of your on-site SEO. Obviously, the goal is to keep visitors on your pages as long as possible. Google’s average benchmark for most pages’ bounce rates differ, with content pages having a 40-60% rate and retail a 20-40%. Making sure your pages are user-friendly and full of great content is the way to bring down your bounce rate. Content is what makes the difference between a good web page and a great one. It can be difficult to come up with the kind of content you need. At this point, you might think of hiring an outside group to help you with this. Content can be a big hill to climb but it’s going to improve your customer’s experience and ultimately, your on-site SEO. It can be hard finding the right keywords but stick with it. Do your research. Use a keyword finder or simply type a search into Google for your product or idea. Sometimes different keyword ideas will show up in autofill. While you might hit upon a winning keyword or phrase, your on-site SEO will suffer if you over stuff your content. Keep it simple. Think of your keyword as a spice that you sprinkle throughout the meat of your content. External links are going to help your site gain authority and will catch the crawlers’ eyes. When you want to be relevant, it helps to link to authoritative sites. Trusted links that are popular in your particular niche raise your credibility. While external linking helps your website rank with different forms of SEO, internal linking helps even more. Keep readers engaged and looping onto your different pages with internal links. Redirect them to previous, relevant content or other products they might be interested in. Keep them clicking around, reduce your bounce rate, and get them engaged with your content. Humans are visual creatures. Make sure your images are not just user-friendly but SEO-friendly as well. Make sure you’ve got your keywords in the image title and the alt text. One problem with images is that if they’re large, they’ll slow down your site’s loading time and you’ll take an SEO hit. Slow loading times get Google’s attention – but in a bad way. Now that you know the inside secrets that are going to change the way your site is seen, you’re almost guaranteed to see a big boost in your views. Believe it or not, there’s more. There’s lots of information out there and it changes every day. Stick with us for the latest trend and updates in the Digital Marketing industry.